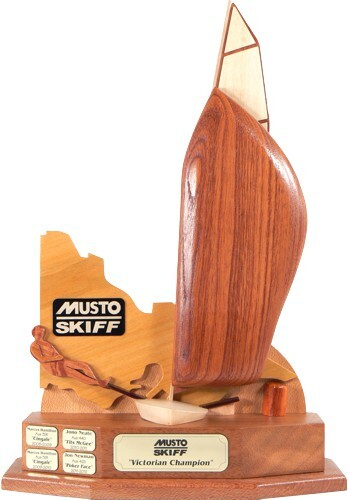 It was way back in 2012 that we made a perpetual trophy for the Musto Skiff sailing class. 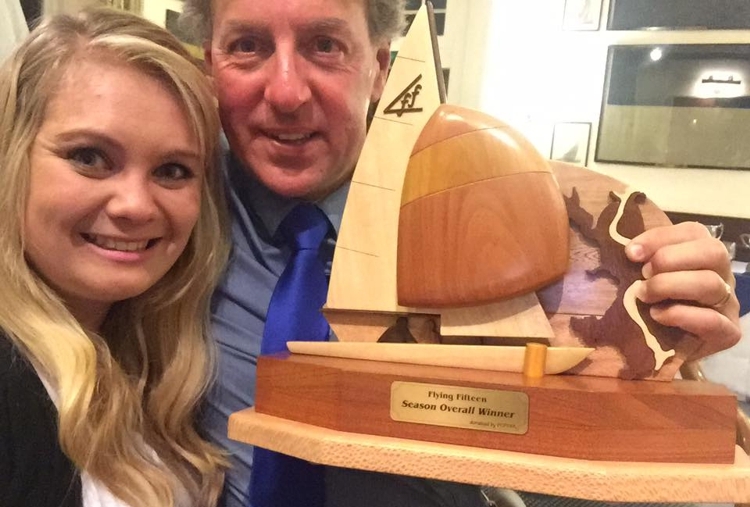 It was a perpetual sailing trophy for the Australian state of Victoria titles. 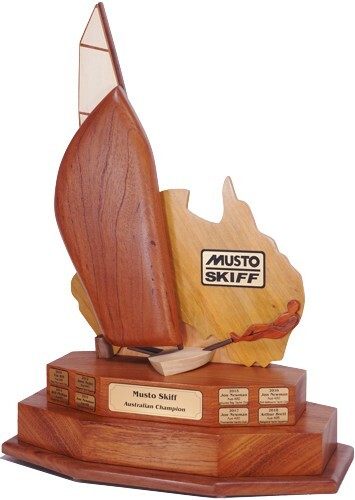 We have recently added a Musto Skiff perpetual sailing trophy for the Australian National Titles. 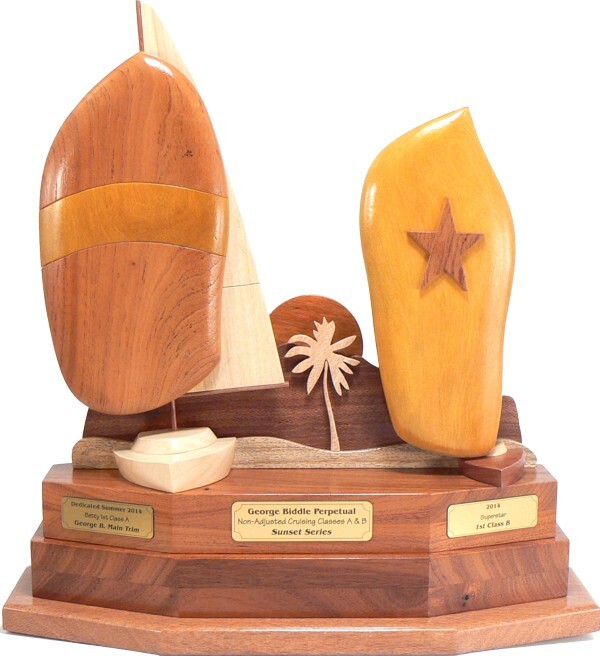 The customer chose to add a double base to the Australian perpetual sailing trophy in order to accommodate many years of annual plaques. 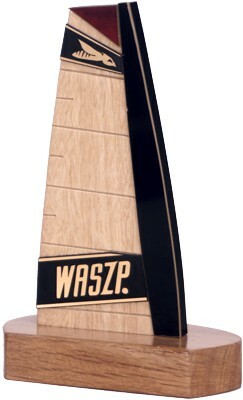 The new, at least in Australia, Waszp foiling class is certainly a challenge to represent as a Waszp sailing trophy with all those fancy sail graphics. But the addition of some engraved plaques works well on these Waszp timber keeper trophies. 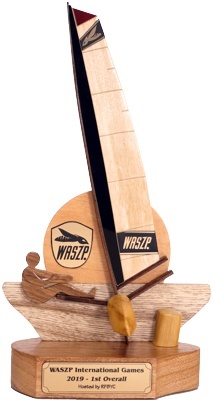 The Waszp sailing trophy on the left is part of our Sail Trophy range. Prices here. And the one on the right is typical of our Boat Trophies. 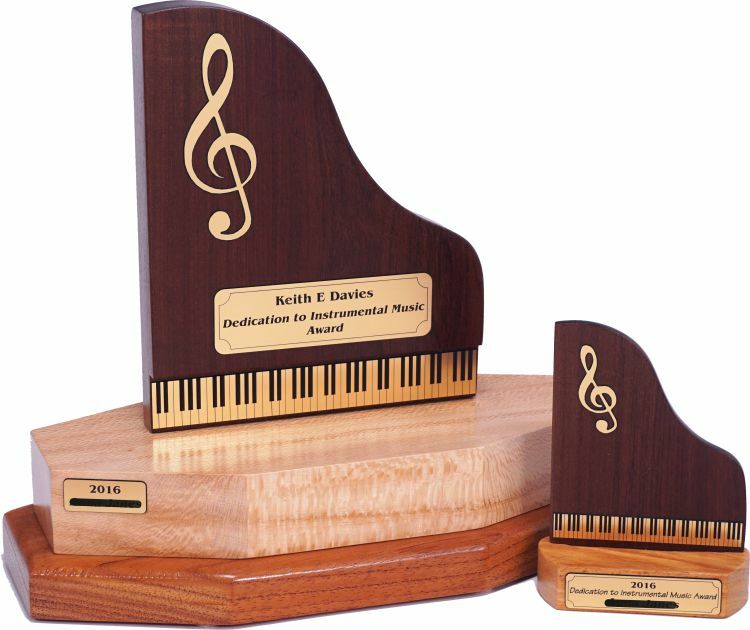 Trophies can be supplied with or without an engraved plaque on the base. We were also asked to provide a couple of perpetual trophies for the Australian National Titles and for the Victorian State Titles. The customer wanted plenty of room for annual plaques, hence the double base at a small extra cost. 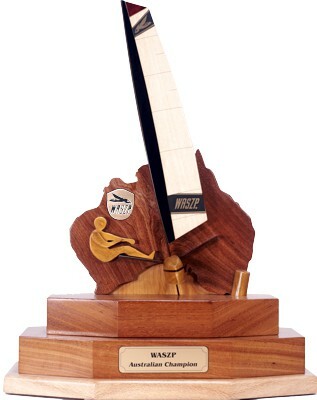 And of course a map of Australia with a timber Waszp sailing trophy up on its foils. We’ve just finished over 200 Sabot sailing trophies for the Australian National Titles coming up in a couple of months time. Here is just one of the designs we created for this event. The senior Sabot sailors sail one up while the juniors sail two up. We were able to add the extra crew to the junior trophies. This year these titles are being hosted by the South East Queensland Sabot Association and they were keen to include their distinctive logo on each trophy. We created this from brushed gold and red marble engraving material. And the organiser seems to like them. “I opened a couple of boxes to have a look and the trophies look fantastic. We had a Nationals committee meeting on the weekend and everybody loved the trophies! Let’s hope the sailors are just as happy. 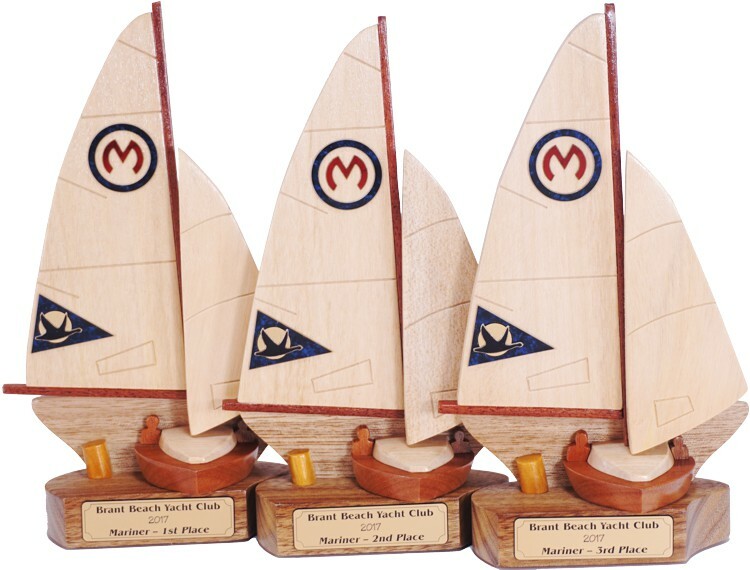 In over 13 years making sailing trophies and having made trophies for well over 100 different sailing classes this is the first time I’ve been asked for sailing trophies for the Mariner class. The Brant Beach Yacht Club burgee on the sail. The correct Mariner sail insignia. 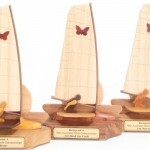 Just sent some windsurfer trophies to Cape Cod for their annual windsurfer festival. 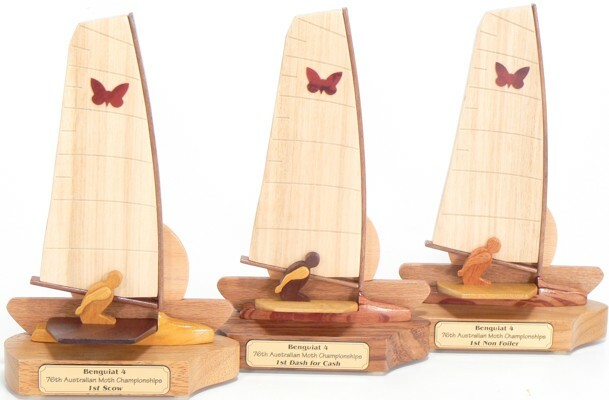 Simple sail trophy designs but they looked great. That beautiful yellow timber is Leichhardt Pine. Named for one of the early Australian migrant explorers who hailed from Germany. And this image has not been photo shopped, it really is that gorgeous colour. We used a map of the Cape Cod peninsula as the logo on the sail of the trophy. And the customer seems happy with them. “The trophies for the ECWF arrived today – they look amazing and we are really happy with them! Thank you both so much for the professional handling, quick turnaround, great packaging and last but not least the superb trophies. My Trophy is a Star! 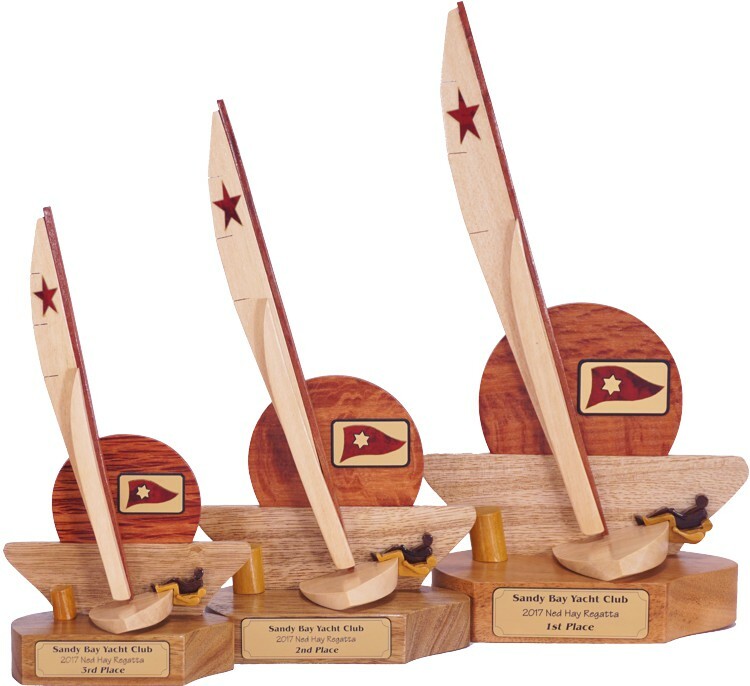 Haven’t made any Star trophies for many years so it was a pleasure to send these to the Sandy Bay Yacht Club, Massachusetts. I was particularly happy with the depiction of the sailors hiking hard over the side. And the customer was also happy. No, I haven’t made a typo, there really are three “f”s in POFFFA. The Port of Falmouth Flying Fifteen Association in southern England. They asked for a perpetual trophy featuring their class plus a map of where they sail. The river estuary with the deep channel picked out in a lighter timber. Abi and Nick look pretty happy being the very first winners of this trophy. We don’t always make sailing trophies, sometimes we branch out into exciting new directions. Such as when a teacher from the high school wanted to commemorate the memory of a local piano tuner. They wanted something simple but stunning for the memorial perpetual trophy plus a little keeper that the winning student could take away with them. This is what we came up with. Happy to say the teacher, and the school, were delighted. I’ve made many trophies for Irish sailors but with this one I did something I don’t often do. I stained the map of Ireland green. I normally only use timbers in their natural colour but as I don’t have any green wood I made an exception in this case. 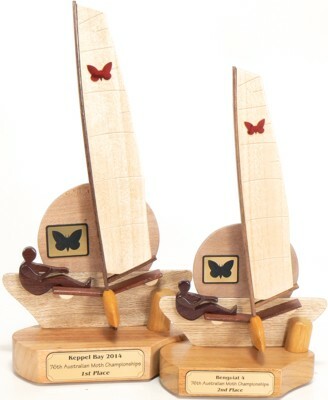 I’ve also made keeper sailing trophies for the Moth class, both with and without foils. You can check some out here. 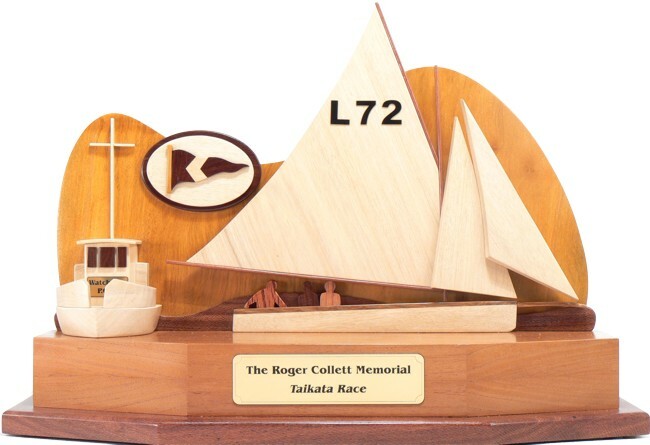 A few years ago I made a perpetual trophy for the 10ft vintage skiff fleet in Brisbane. They must have liked it because they’ve just ordered 5 keeper trophies of a similar design. 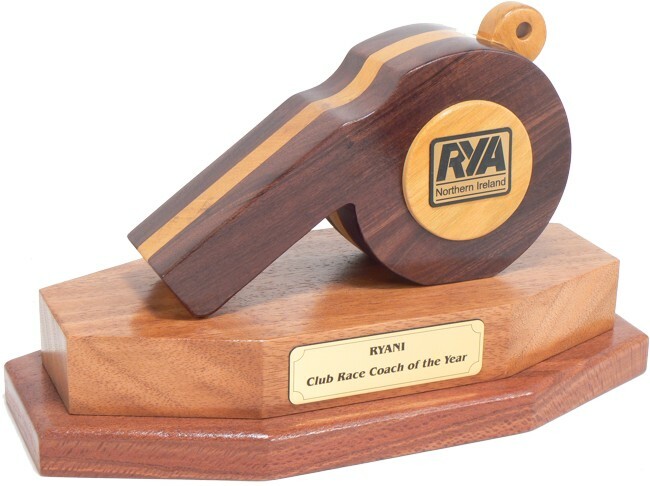 The club is going to present one to the best boat over the next 5 seasons. Foresight and planning. 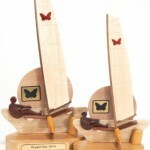 I need more customers who order their sailing trophies 5 years in advance. Large enough to take many years worth of annual plaques. Include a map of California. Show a palm tree which not only adds visual interest but says we are lucky enough to be warm water sailors. The customer was impressed enough to go ahead with the order. This is what he said after he had received the final trophy. “I received it today and it looks better than the rendering you had send me some times ago. A map of Lake Minnetonka. Not the whole lake, just the end they sail on. The boat to look like an S2 with their 7/8 rig . Water line black band which I added from natural timber. Class logo engraved on flexi-brass. All in all they didn’t turn out too badly. 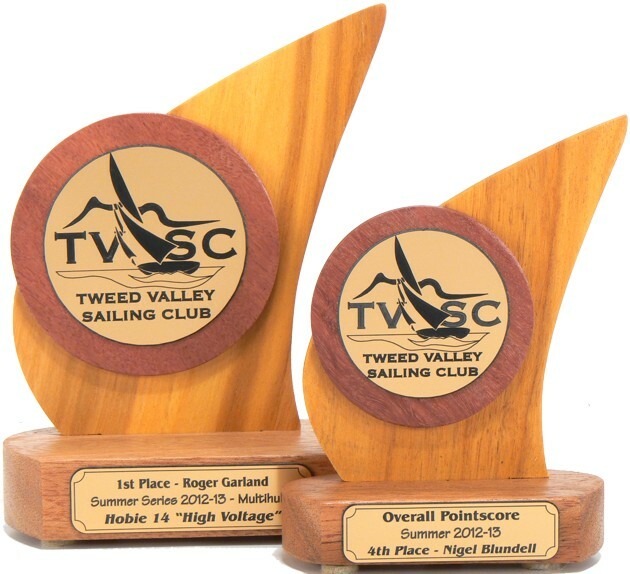 This is the third year that the Tweed Valley Sailing Club have ordered these budget sailing trophies. And, as with all our trophies, they are made from natural coloured timber. 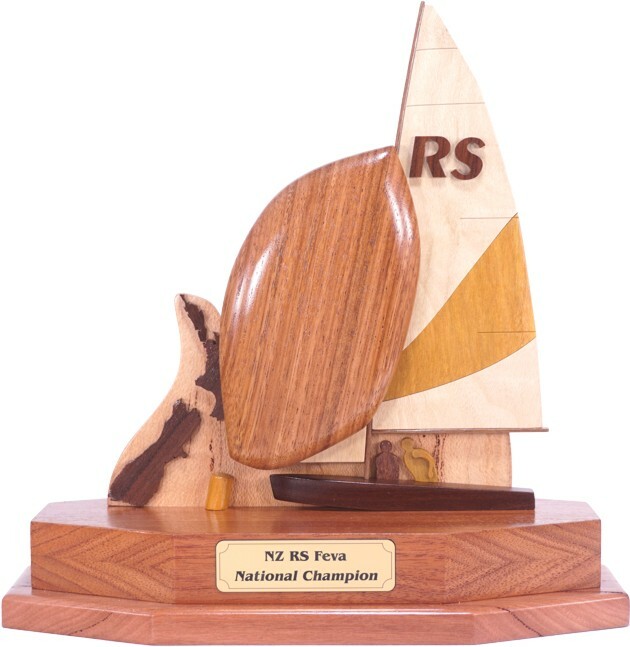 Okay, it may not be the first but as the RS Feva sailing class has only just been introduced into New Zealand and as it was the class agent who ordered this I’ve a good chance of being right. 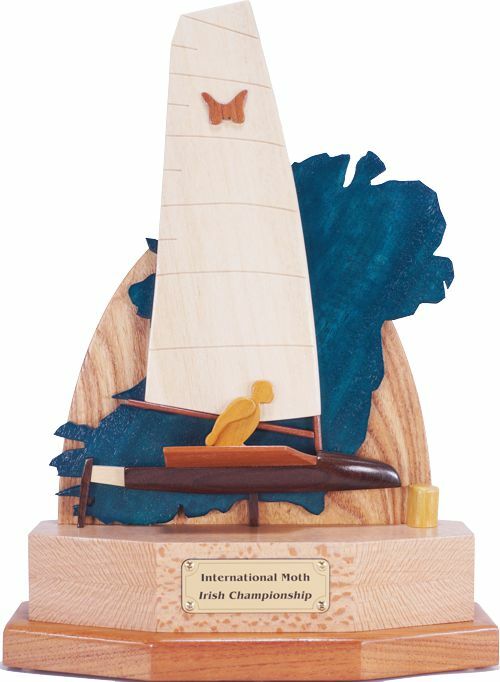 This sailing trophy needed to depict the RS Feva with its distinctive sail stripe as well as including a map of New Zealand. And enough room on the base for a few years of annual plaques. And the customer seemed to like it. The RS Feva Trophy looks fantastic thank you. 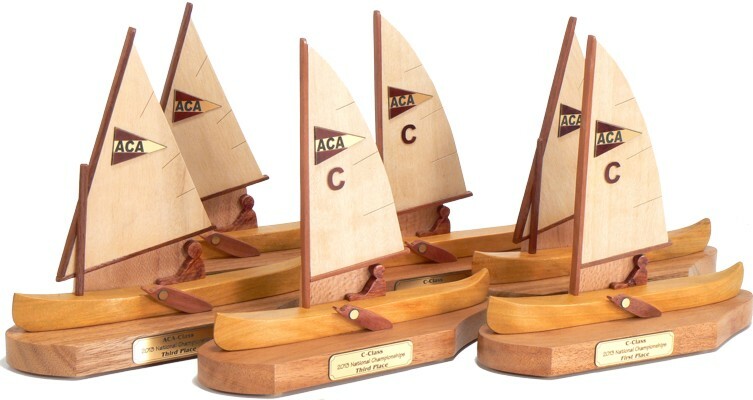 The American Canoe Association has had a few different trophies from us over the years. I’ve never tried canoes with sails but it sounds like a great idea to me. Beats paddling. 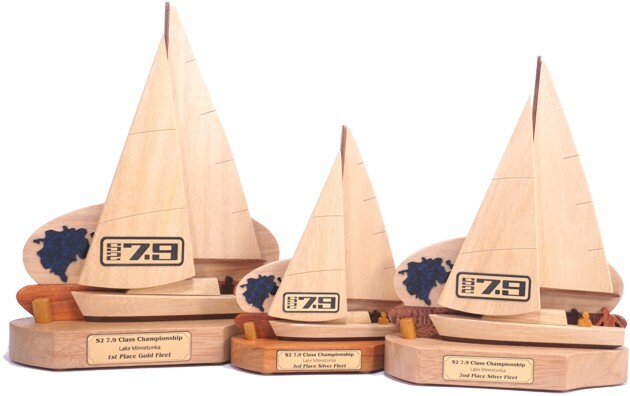 These trophies are a mixture of lateen and marconi rigs and include the ACA burgee. 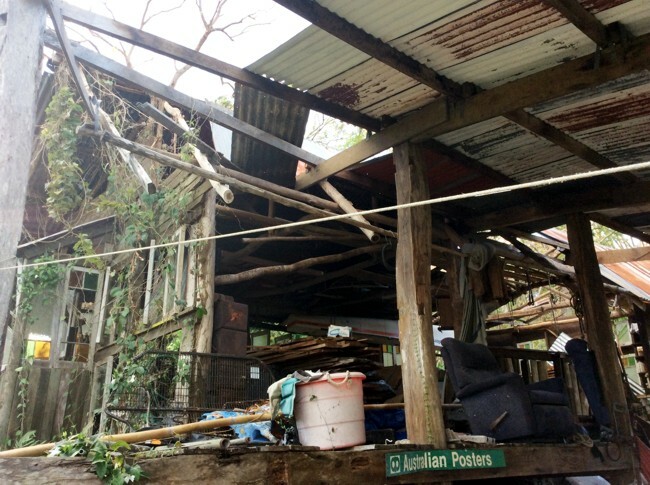 It’s been a couple of months since Cyclone Marcia passed over our small community of Byfield. It hit as a category 5, the most severe. 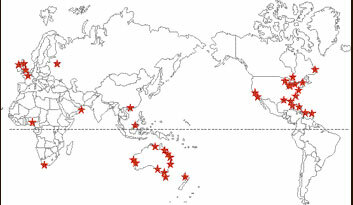 There’s only been 10 category 5s to hit Australia in the last 150 years and 7 of those have been since the year 2000. 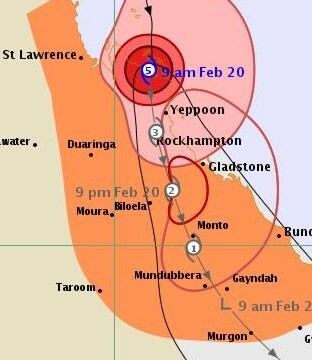 The map shows the position of the cyclone on the morning of 20th Feb right over the top of our place! It passed over in about 4 hours with winds of up to 280kph. In the first week after the cyclone my son Jake Bundred was an enormous help with getting our water supply back up and working. 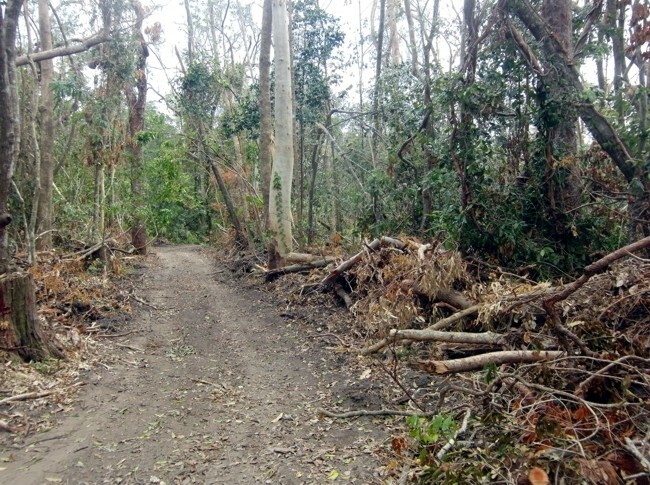 Below are a few post Marcia photos from around our property. Some minor damage to buildings. 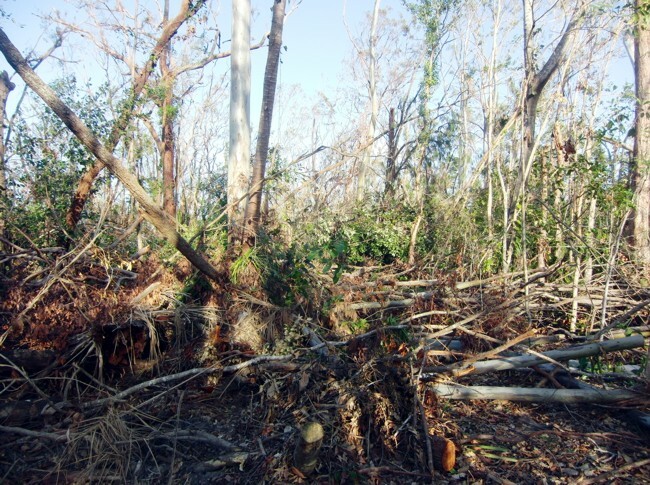 Some major damage to the trees. We used to live in a rainforest, we are now in open woodland with an enormous number of trees lying on the ground. 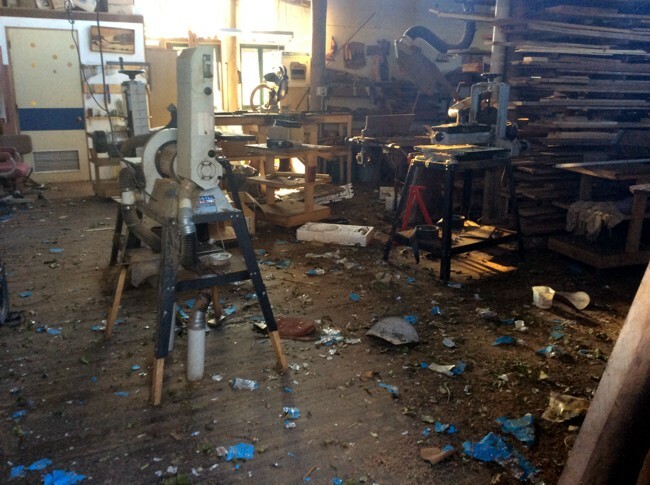 On the positive side we have no shortage of timber to make many more trophies. 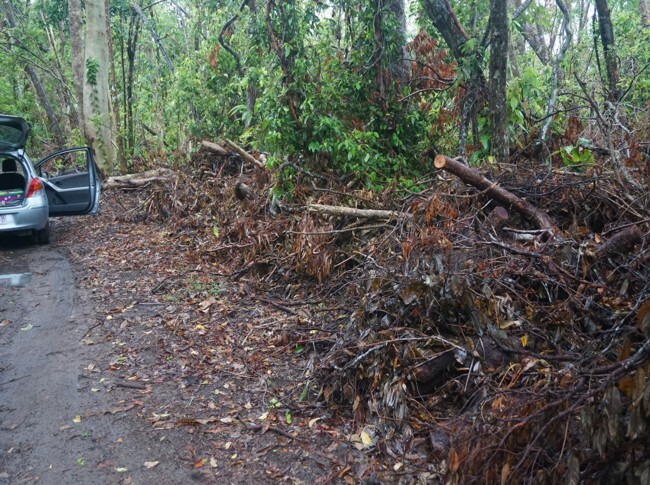 Our driveway after the army had cleared it for us. 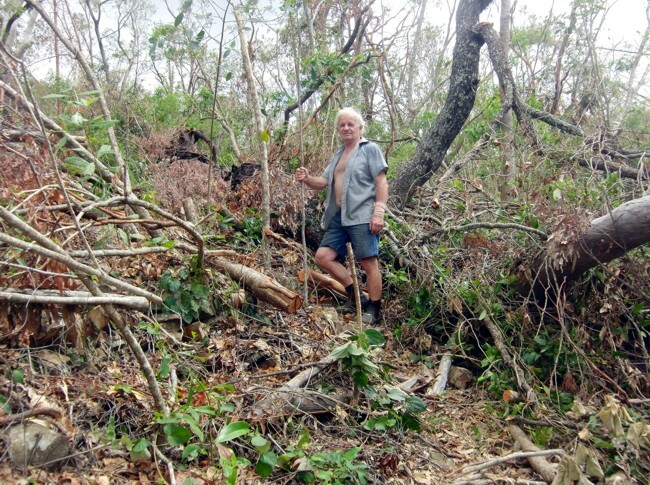 We have another 70 acres of fallen trees. 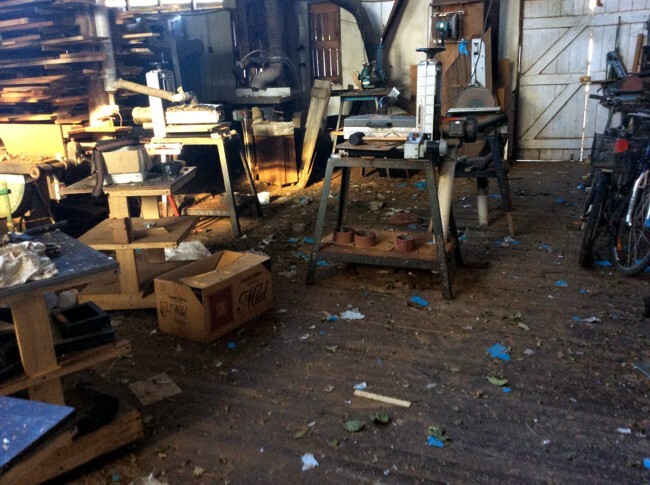 The inside of our workshop. Even more untidy than usual. One of our storage sheds has less roofing iron than it should. Me pretending I've got everything under control. 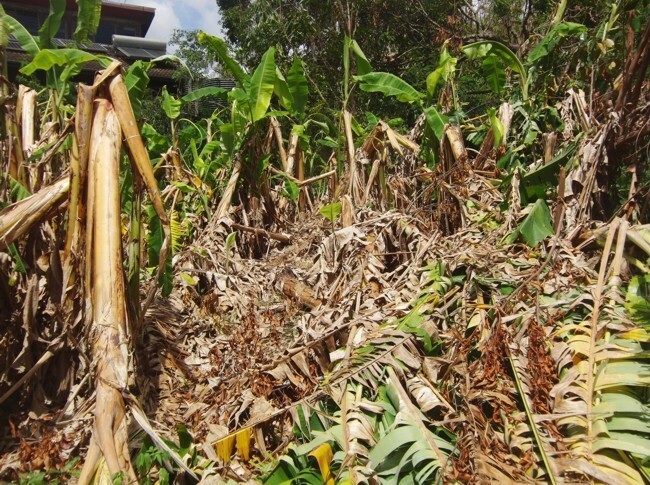 What was left of our banana patch. Made for the Royal Yachting Association of Northern Ireland earlier this year. All coaches need a big whistle. This one went to New Zealand earlier this year. Club burgee from natural timber colours. The customer requested a list of the timbers that I’d used. Here it is. 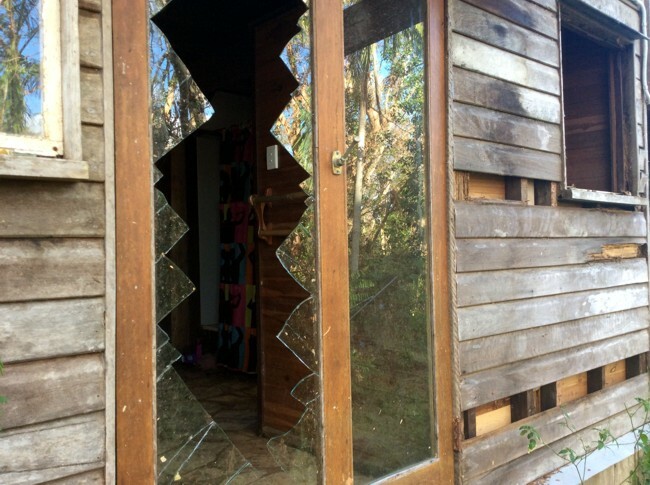 Black on and around burgee, dark crew and Watchman windows – Rosewood, a local wattle (acacia rhodoxylyn). 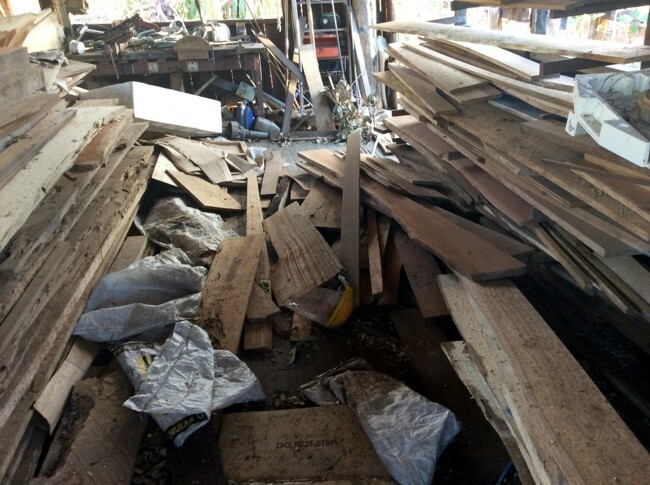 The common name rosewood is used for numerous timbers. Deck on Mullet – a local wattle? 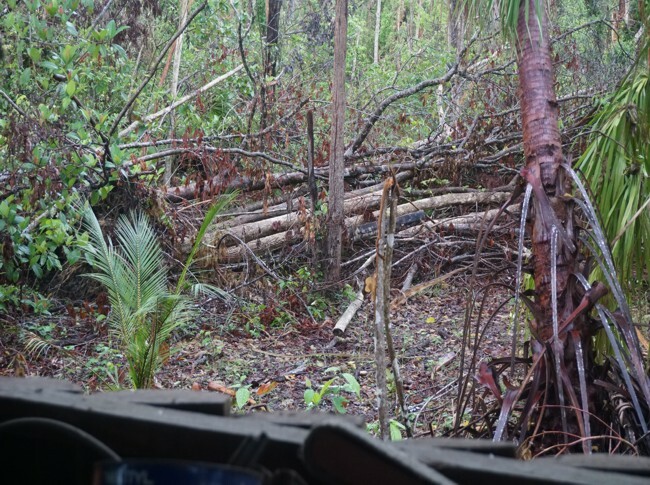 Spars – maybe Blue Gum. Or one of our local hardwoods. 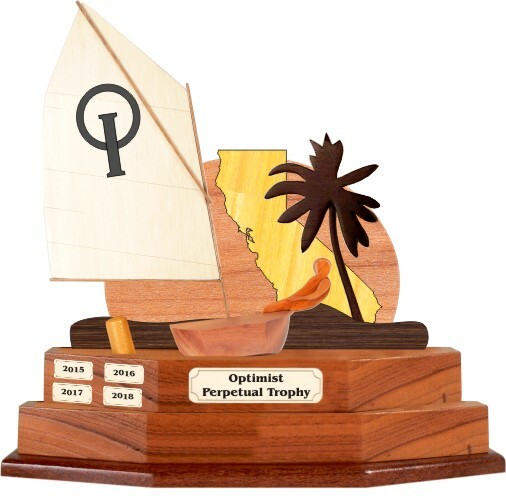 This special perpetual sailing trophy has just arrived in Marina del Rey, California. A double base for many years of annual plaques. It arrived safe and sound, on time, and BEAUTIFUL! 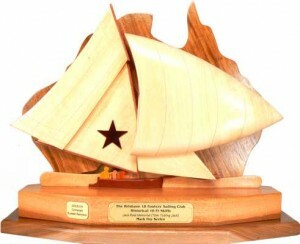 It will be the most handsome trophy in Marina del Rey! Heck.. California! Thank you for your wonderful service. Any doubts I had working with a company so far away melted right from the start with your prompt replies. As an artist myself (custom nautical jewelry), I love your method of mockup, I knew what I was getting when I placed the order. I have a feeling you may hear more from this area when this gets seen.